ARTHUR Schopenhauer was born in 1788 to a wealthy family living in the German city of Danzig, which has since been incorporated within Poland and renamed Gdansk. 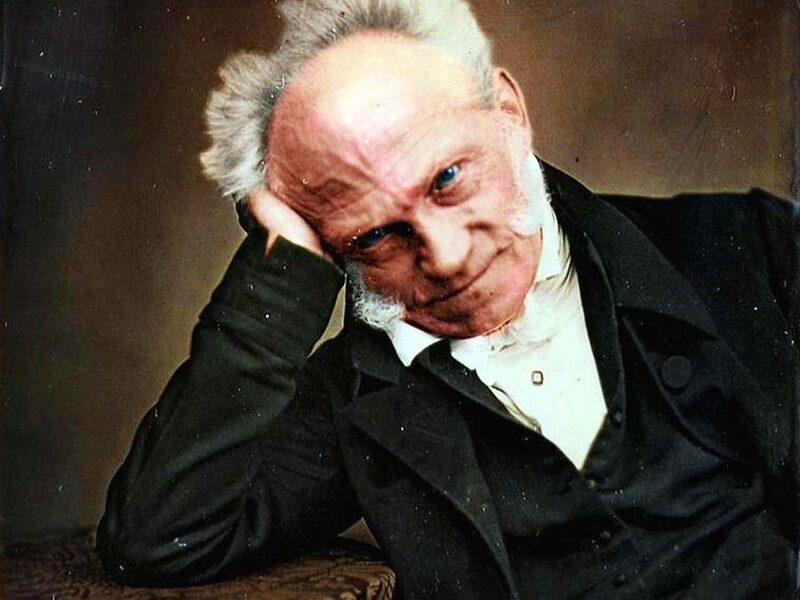 In 1809 Schopenhauer attended the University of Göttingen and studied Psychology and Metaphysics, before going on to devote himself to philosophers such as Plato and Kant (whom he later criticised). By 1813, at the tender age of twenty-five, he produced his On the Fourfold Root of the Principle of Sufficient Reason (1813) and then, one year later, began his Die Welt als Wille und Vorstellung, or The World as Will and Representation, finally completing this important work in 1818. Two years later Schopenhauer became a lecturer at the University of Berlin alongside Friedrich Hegel and, despite the former’s attempts to engender a healthy competitiveness, was to eventually dismiss his more popular rival as ‘a clumsy charlatan’. This period marked Schopenhauer’s increasing disillusionment with the world of eighteenth- and nineteenth-century academia. Meanwhile, despite being portrayed as the quintessential doomsayer, in our modern world of accelerating meaninglessness Schopenhauer’s perceptive thoughts on suffering, morality, art and self-awareness need to be re-examined by a new generation of radical thinkers. all that opposes, frustrates and resists our will, that is to say all that is unpleasant and painful, impresses itself upon us instantly, directly and with great clarity. the mere abolition of a desire and extinction of a pain. the feelings of an animal engaged in eating another with those of an animal being eaten. which never lets us so much as draw breath but pursues us all like a task-master with a whip. It ceases to persecute only him it has delivered over to boredom. This issue was examined more recently by the Anarchist thinker, George Woodcock, in his highly relevant essay The Tyranny of the Clock (1944). But whilst Woodcock views Time as a form of social and economic control, Schopenhauer explains that Time is linked with suffering because it actually fills a void and thus helps to alleviate the monotony and tediousness of human existence. This arises first and foremost because with him everything is powerfully intensified by thinking about absent and future things, and this is in fact the origin of care, fear and hope, which, once they have been aroused, make a far stronger impression on men than do actual present pleasures or sufferings, to which the animal is limited. Animals, of course, by living entirely in the moment, are completely unable to reflect upon their lives in the way that we humans do and therefore when things become either problematic or comparatively easier they do not suffer the corresponding feelings of despair and relief or possess the same aspirations for the future. Humans inevitably heighten these feelings by using drugs or alcohol, particularly today, and this results in people going beyond their basic needs and making themselves unhappy. Boredom, too, according to Schopenhauer, is also an inescapable part of the human experience and this, too, is not felt by animals. There is a good reason for all this, of course, and man’s superior intellect means that he is able to dwell upon the nature of his own circumstances, be they good or bad. The tendency towards suffering occurs when man becomes aware of his impending death, whilst “the animal only instinctively flees it without actually knowing of it and therefore without ever really having it in view”. Schopenhauer believes, therefore, that animals and plants are far more content with their lives than humans, although in many cases it all depends “how dull and insensitive he is”. For our existence resembles nothing so much as the consequence of a misdeed, punishment for a forbidden desire. However, Schopenhauer also believes that Old Testament allusions to a Fall of Man serve a far greater purpose than an endless and potentially futile pursuit of heaven, because they prepare us for the suffering and hardship that we are bound to encounter throughout the whole of our lives. This need not cause us to embrace those religions which promote such doctrines, but adopting the general ethos of this concept will ultimately help to shatter the dangerous illusions held by the modern progressives with their utopian, pseudo-egalitarian fantasies about ending war and poverty. Schopenhauer was not a pessimist, he was a realist, and we can do a lot worse than seek to acknowledge the stark realities of the human condition and prepare ourselves for the trials and tribulations of the future.